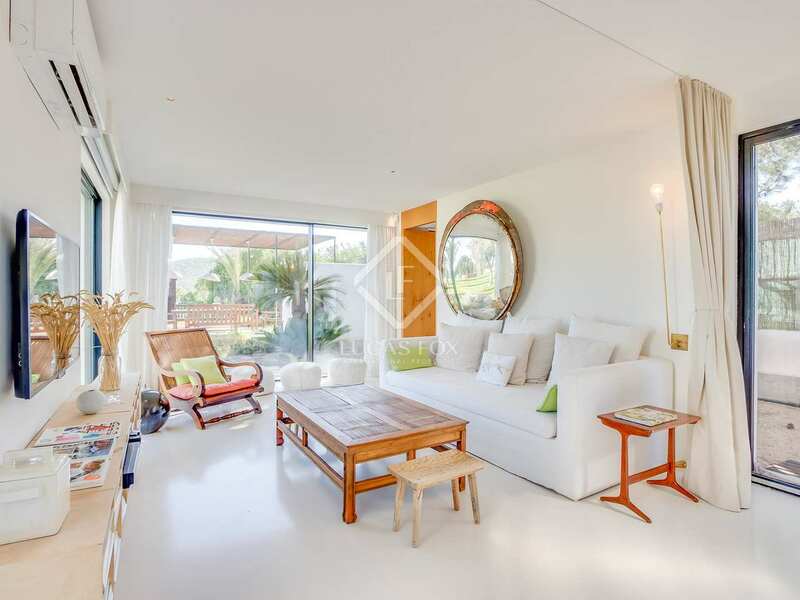 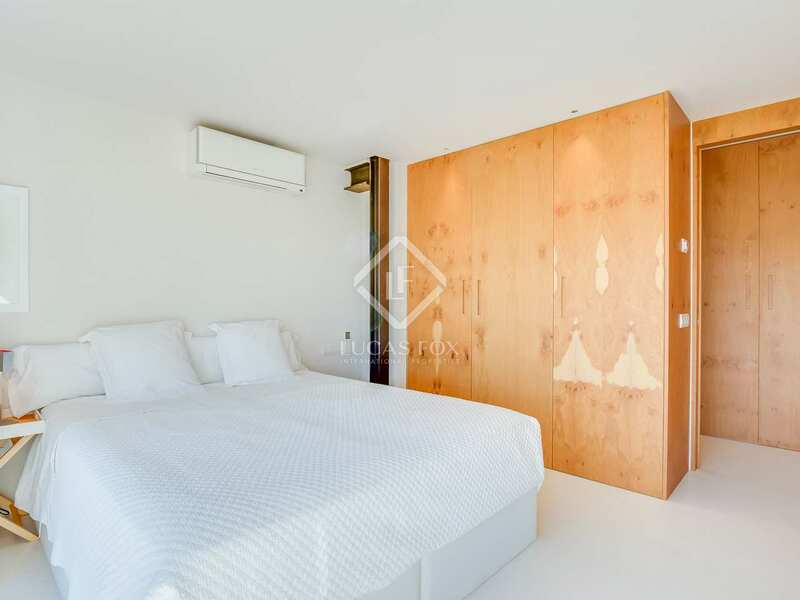 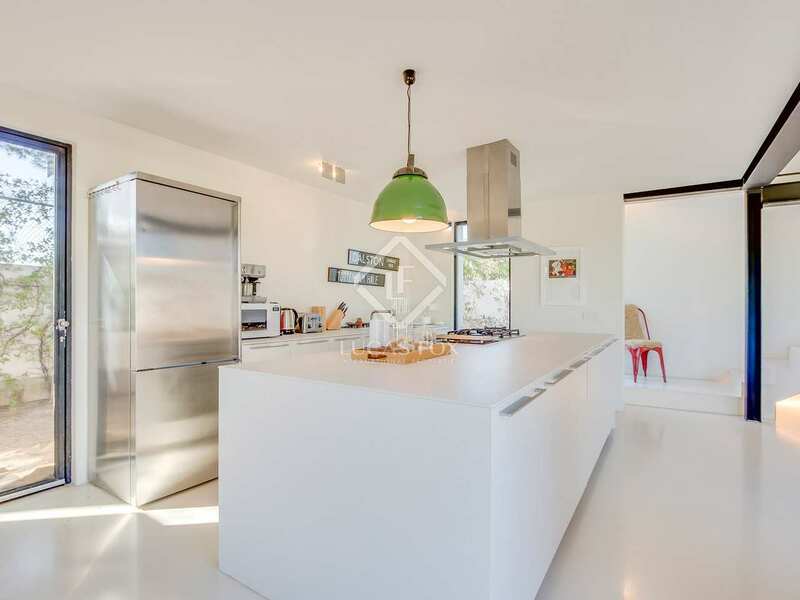 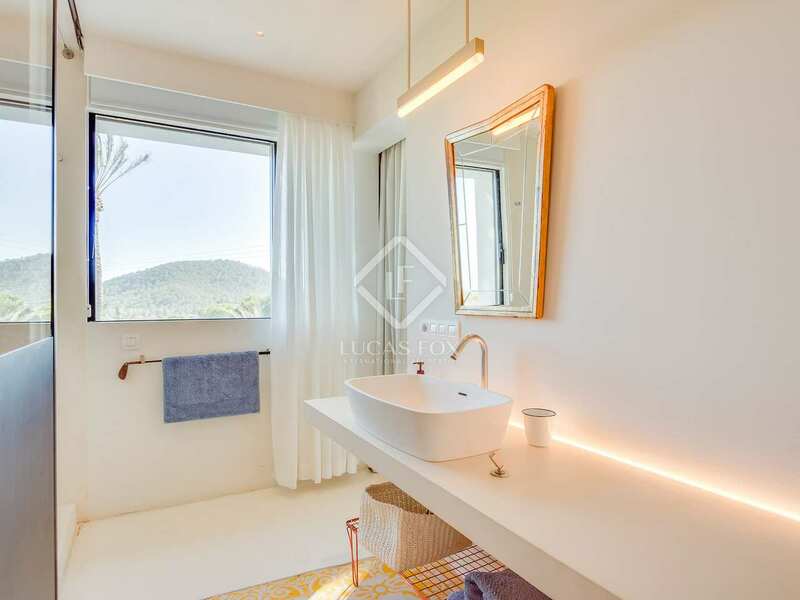 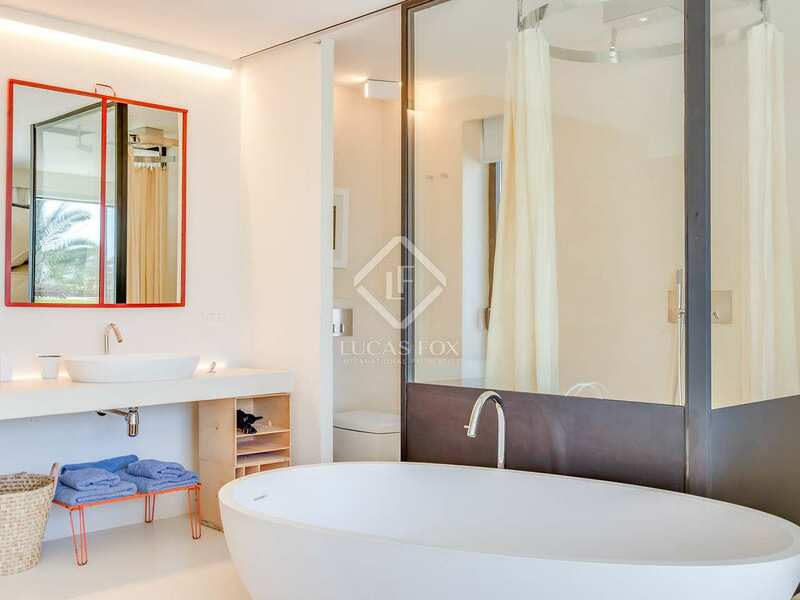 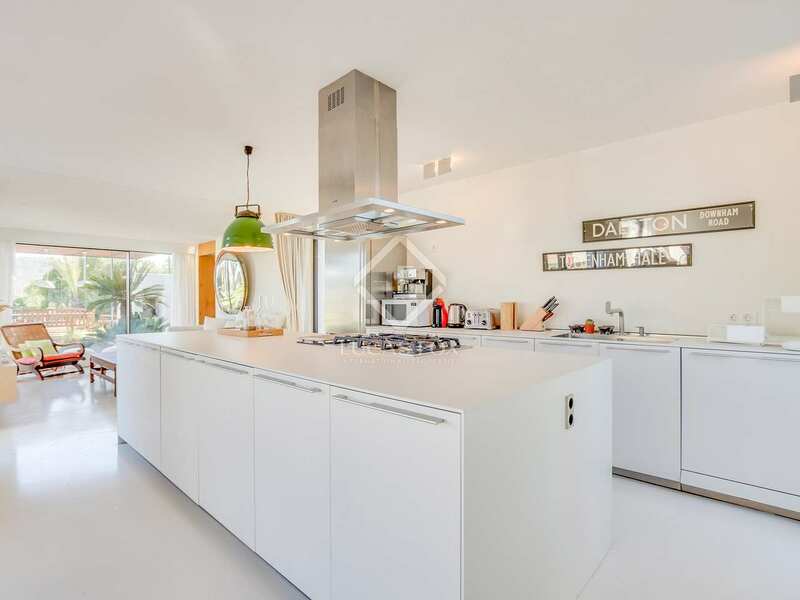 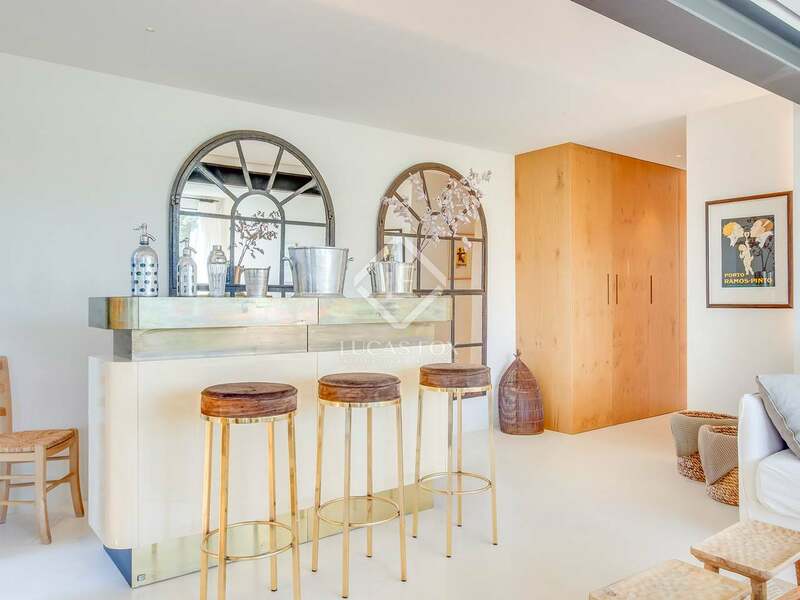 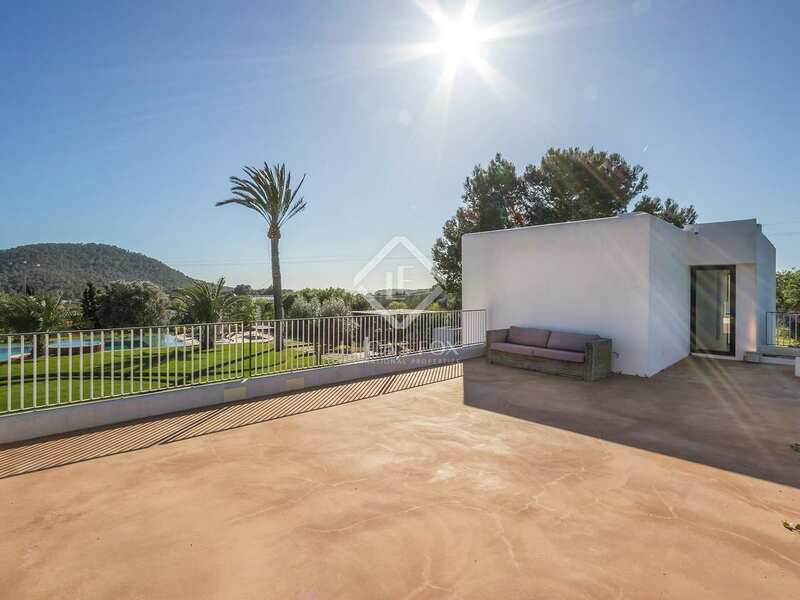 Exceptional contemporary villa for sale in the San José area of Ibiza with beautiful outdoor space and sea and mountain views. 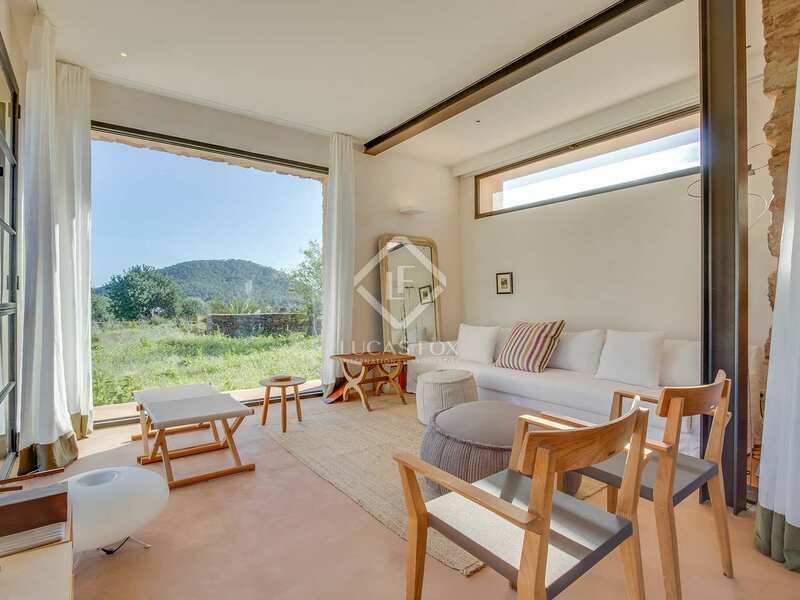 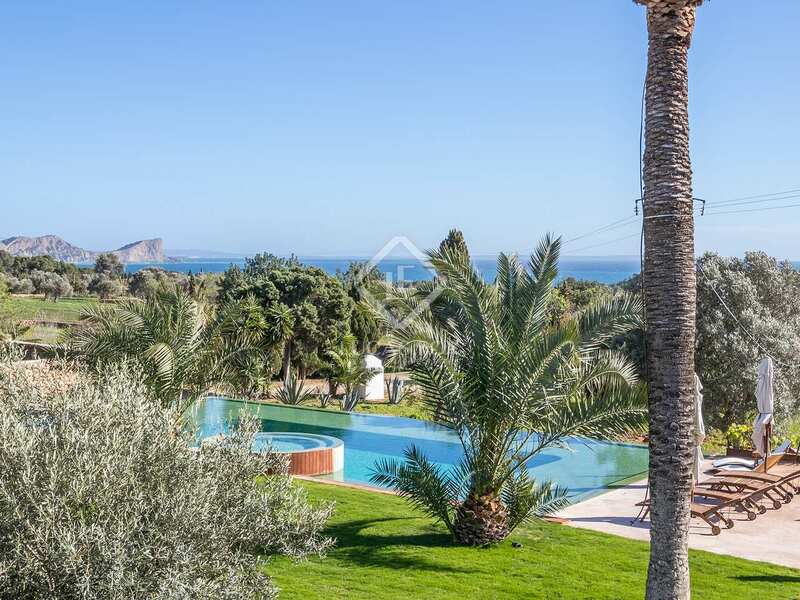 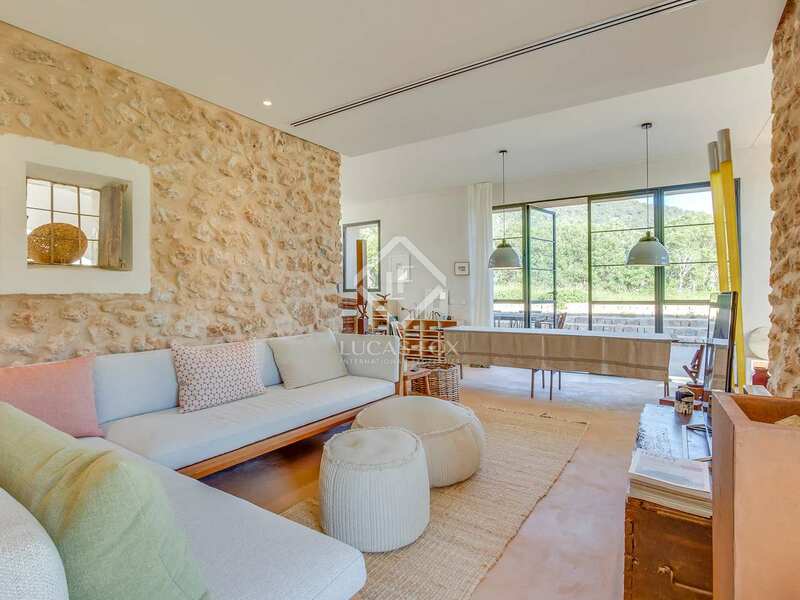 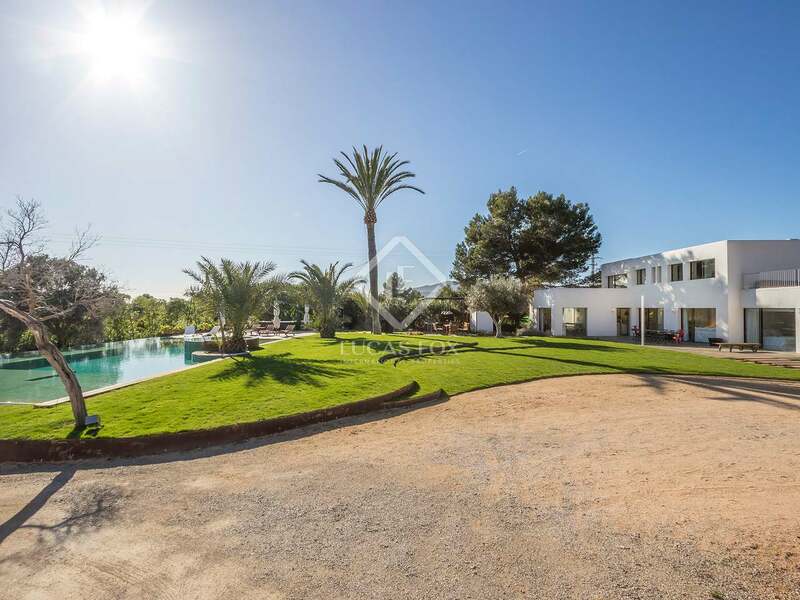 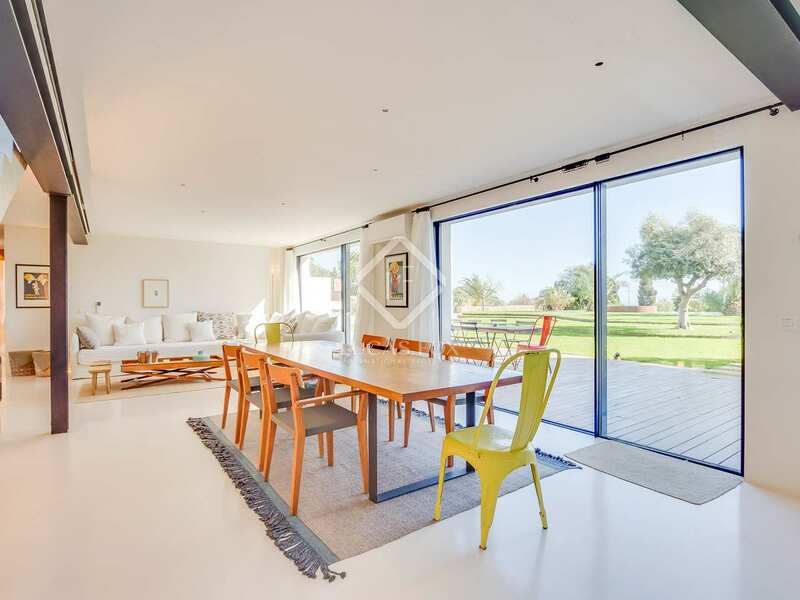 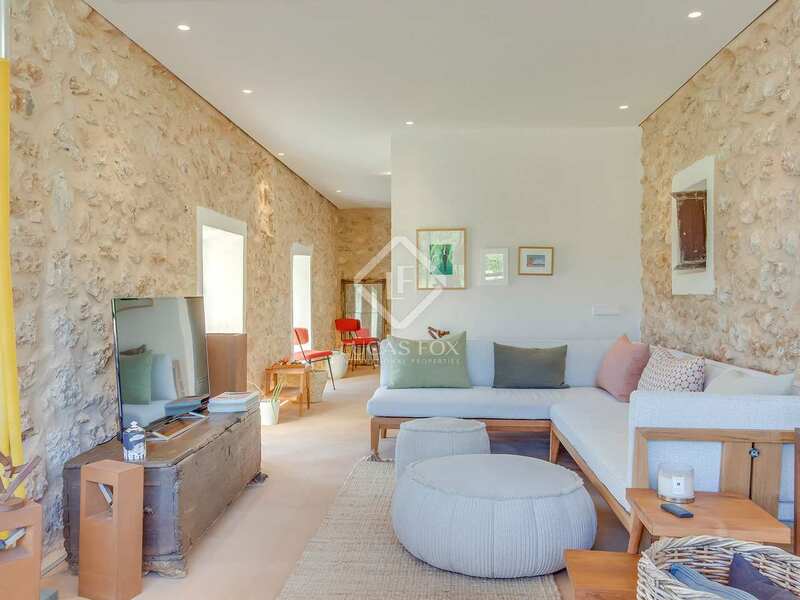 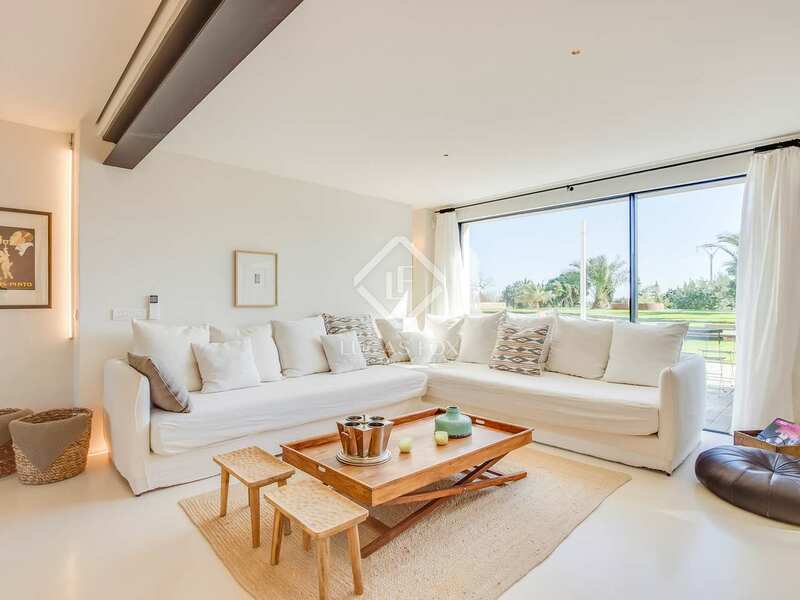 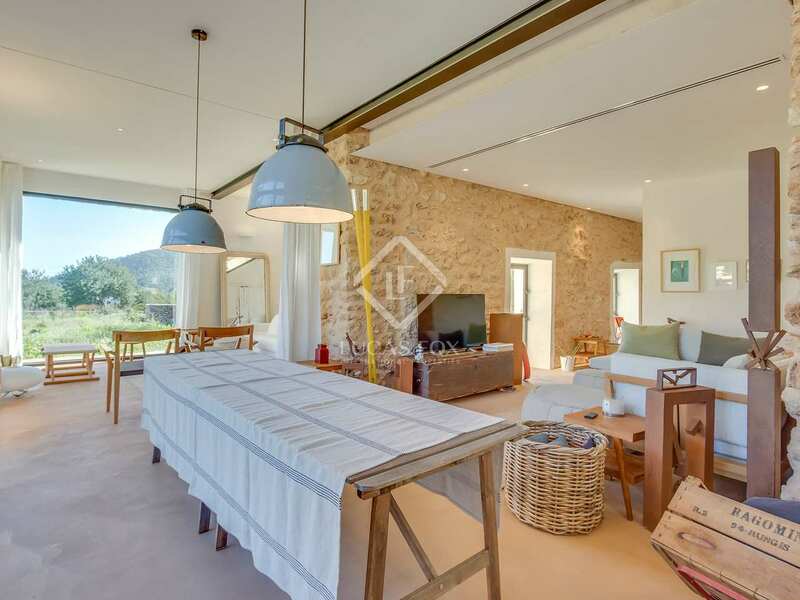 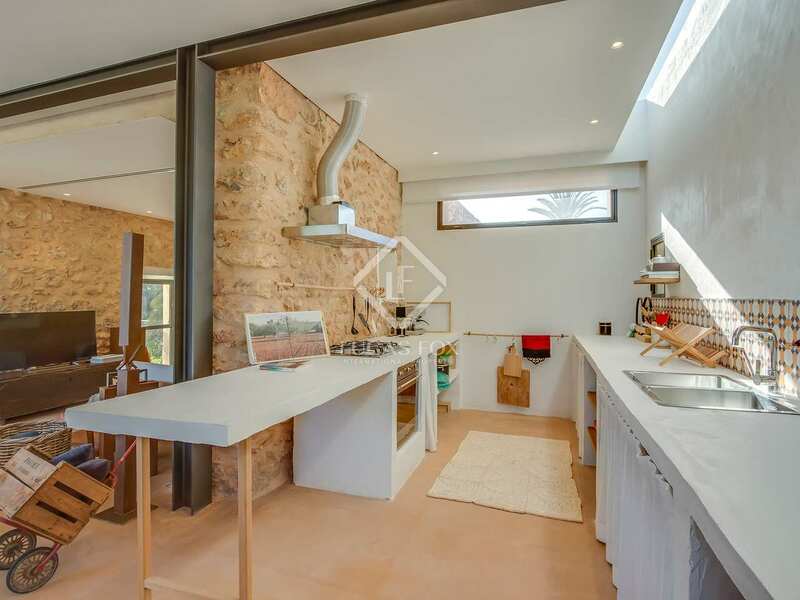 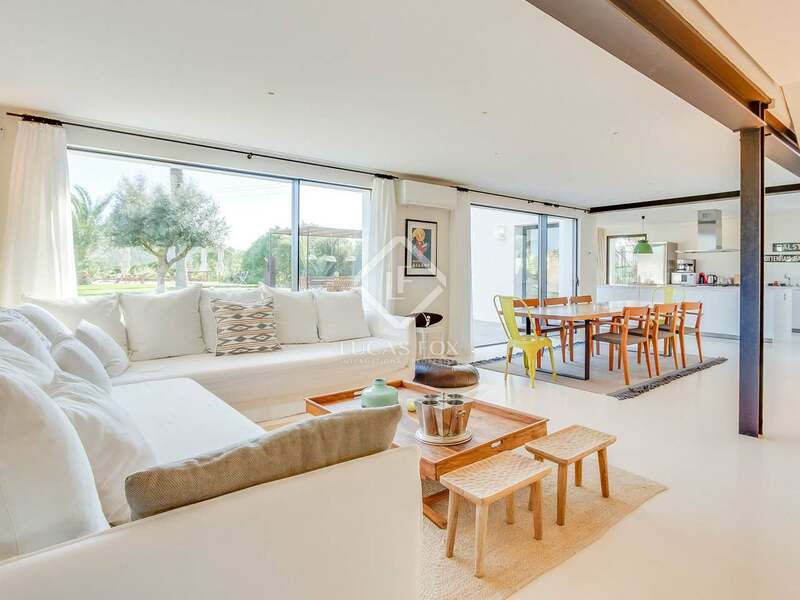 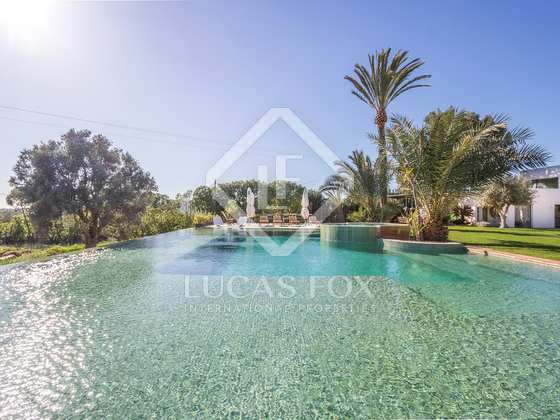 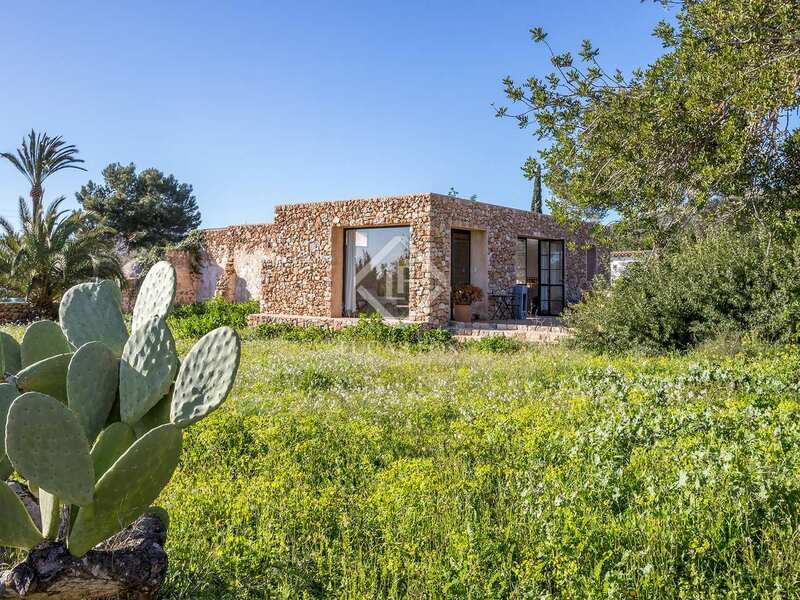 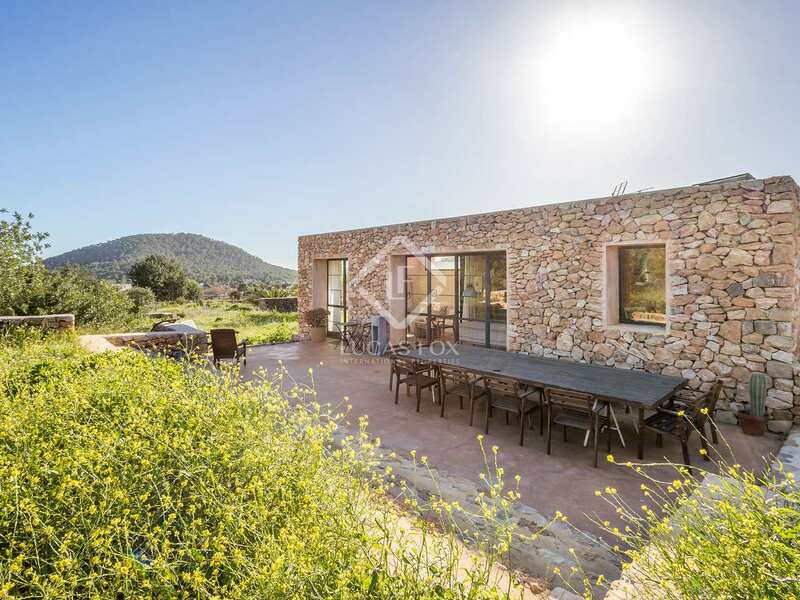 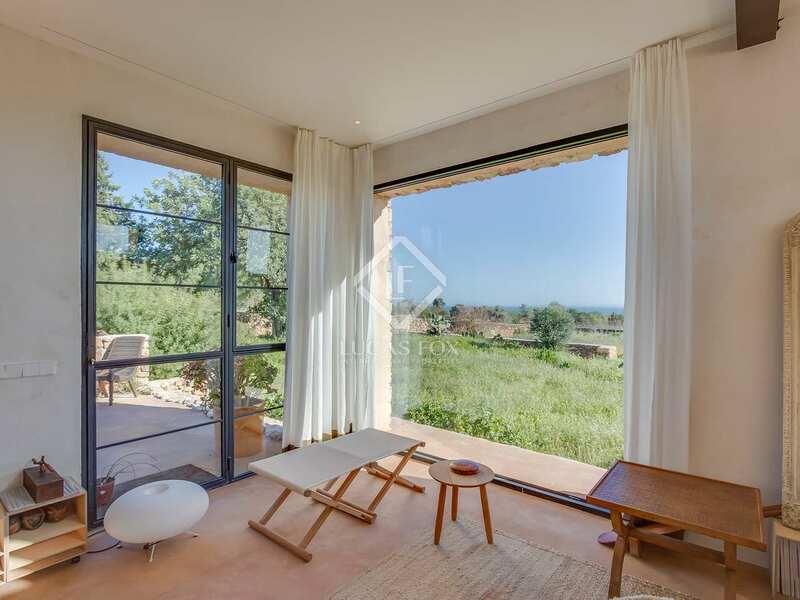 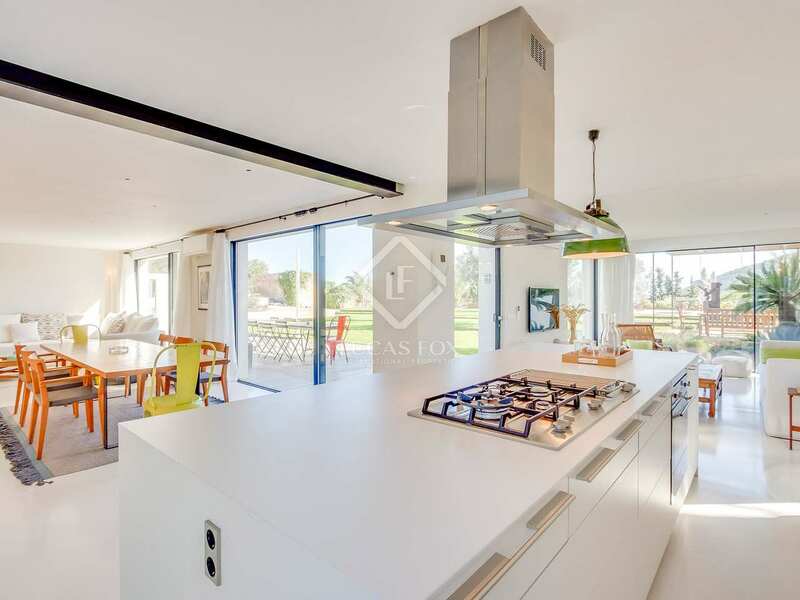 This spectacular villa for sale is a stunning home in Ibiza and an excellent option for those who wish to enjoy the countryside whilst being close to San Jose and Ibiza town. 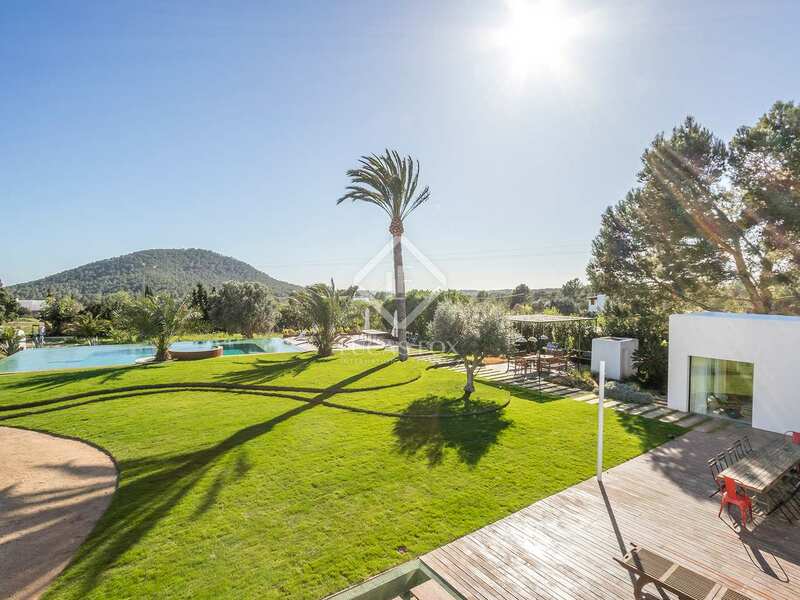 Surrounded by gardens and countryside, residents enjoy total privacy and tranquillity yet at the same time the airport can be reached in 7 minutes and many of the islands stunning beaches are a short drive away. 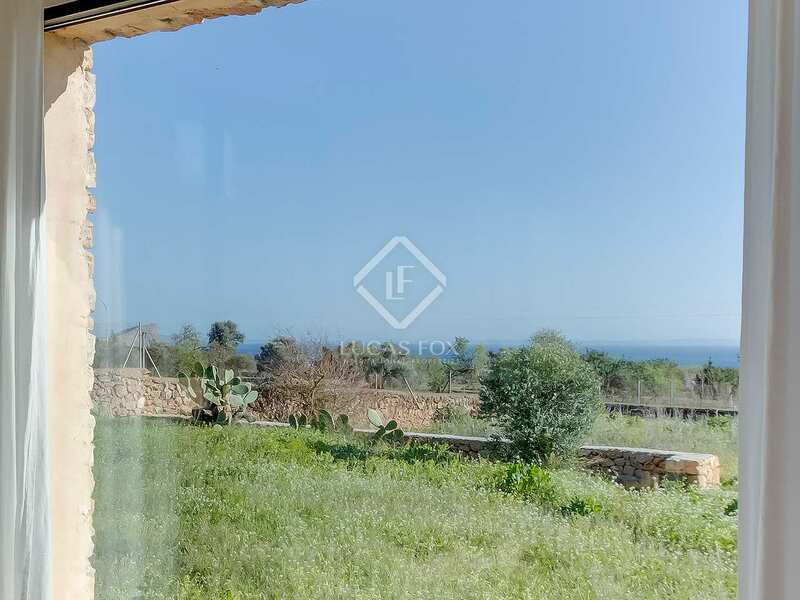 With 4 double bedrooms, with en-suite bathrooms, the property is ideally suited to families or as a holiday home to spend time with friends. 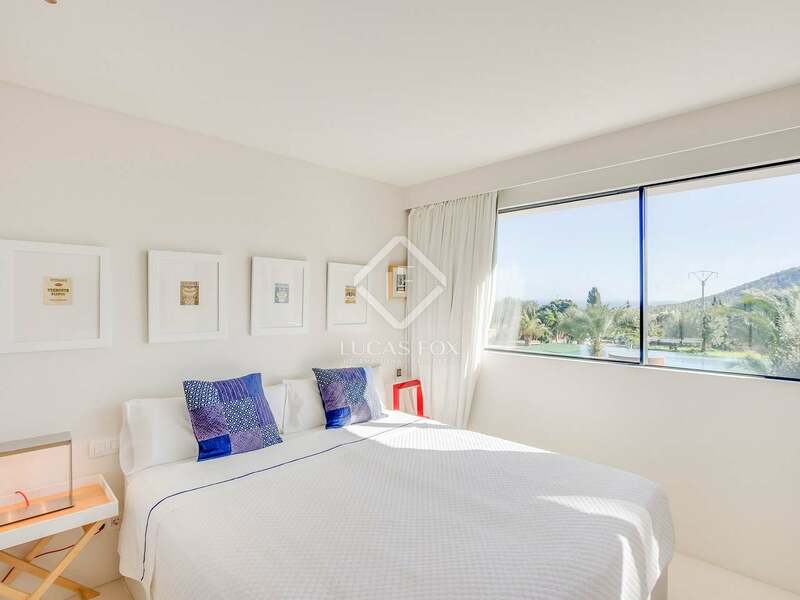 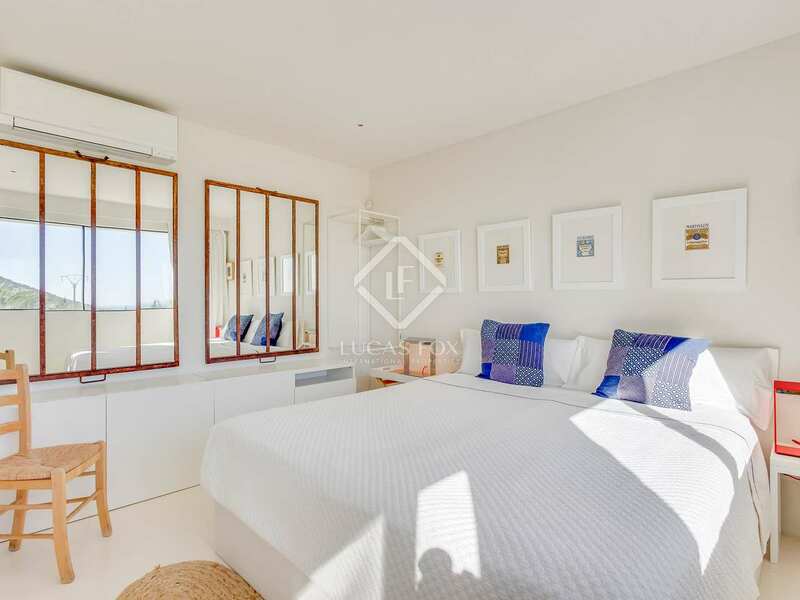 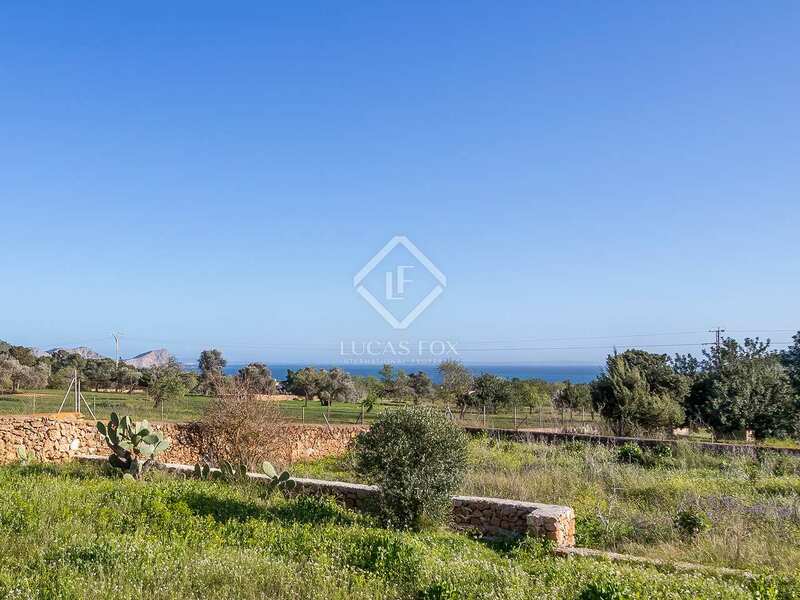 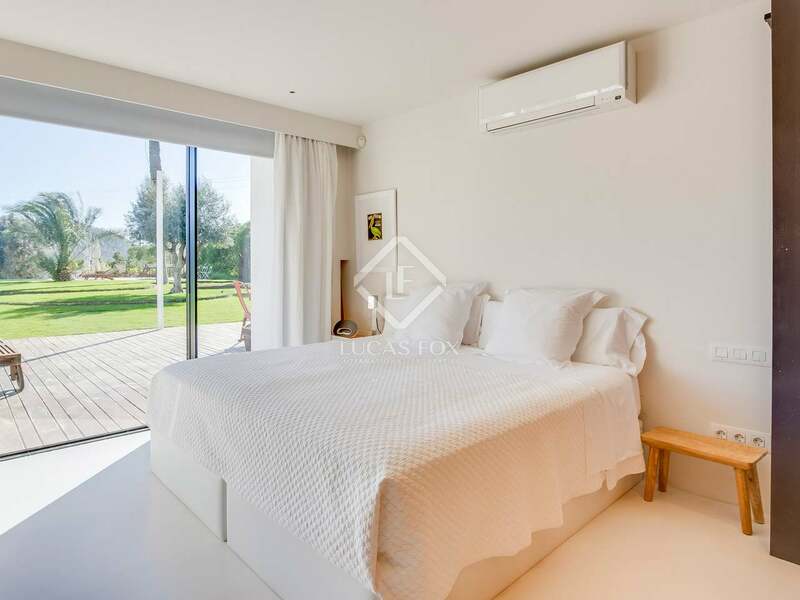 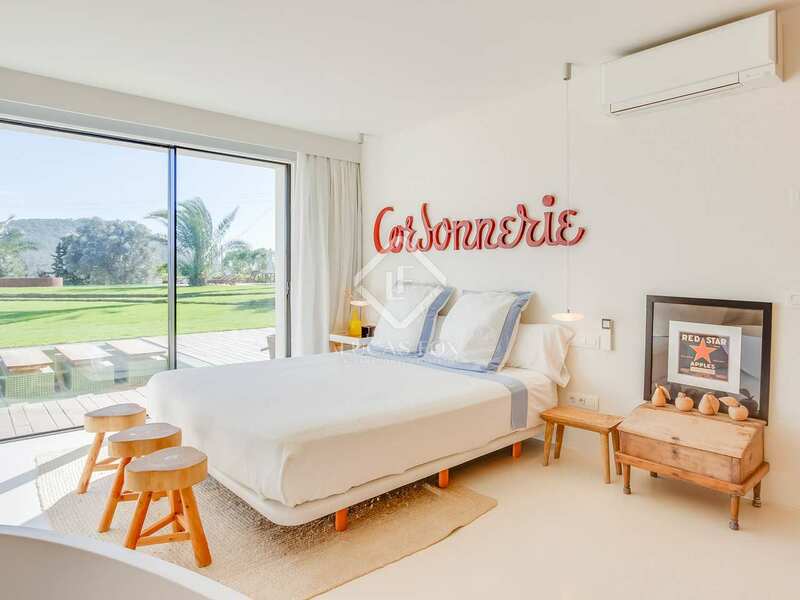 Two of the bedrooms on the upper floor have large terraces with sea and mountain views. 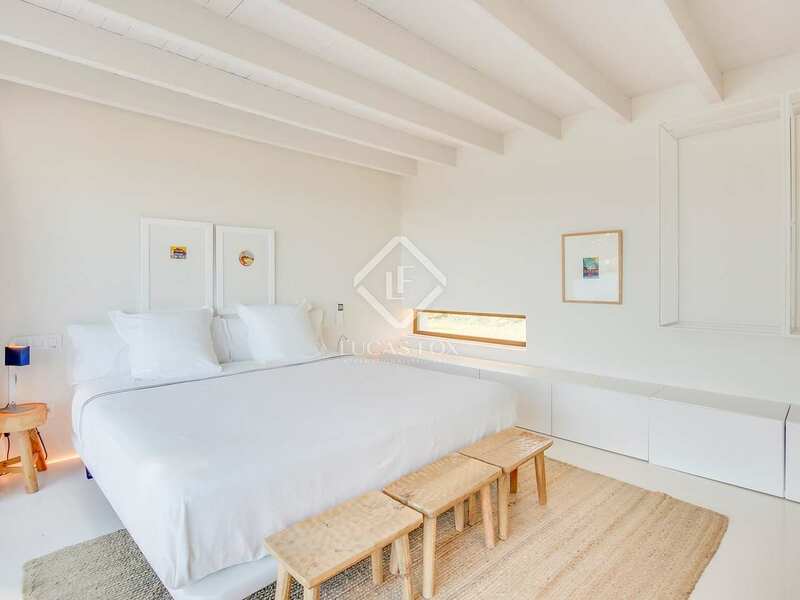 A king size sofa bed in the lounge provides yet further accommodation, this room could be converted into a 5th bedroom. 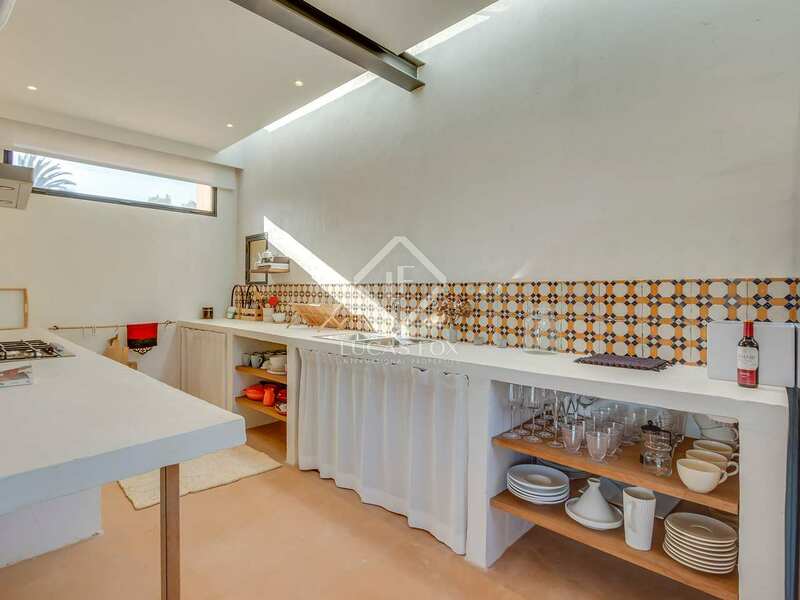 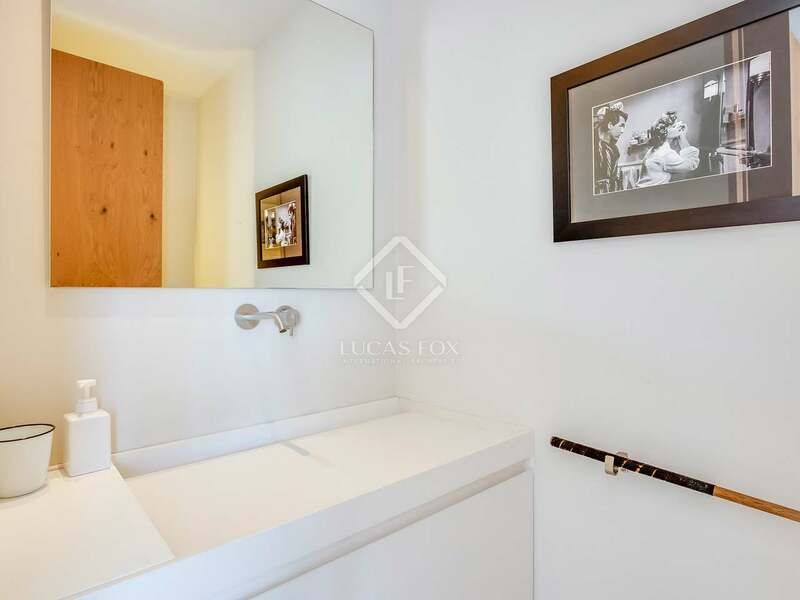 The large dining area seats up to 8 diners and the modern kitchen is fully equipped, there is also a laundry room. 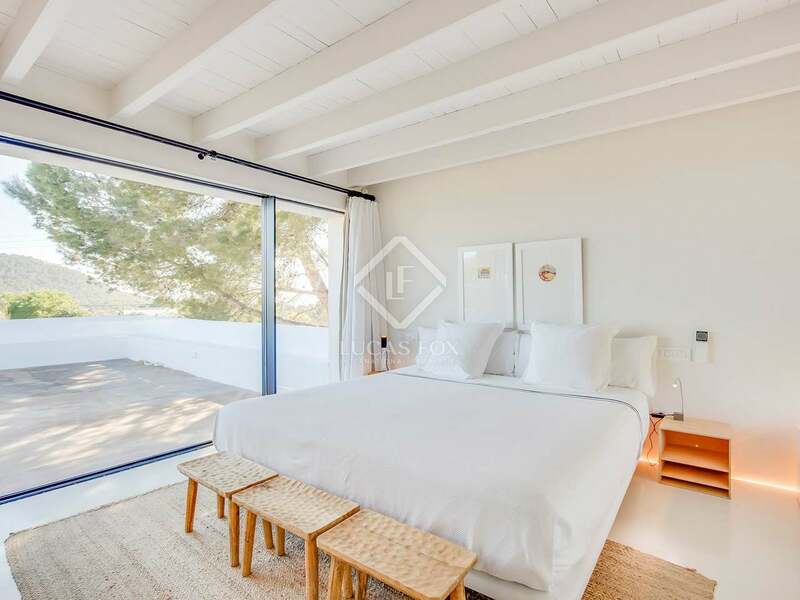 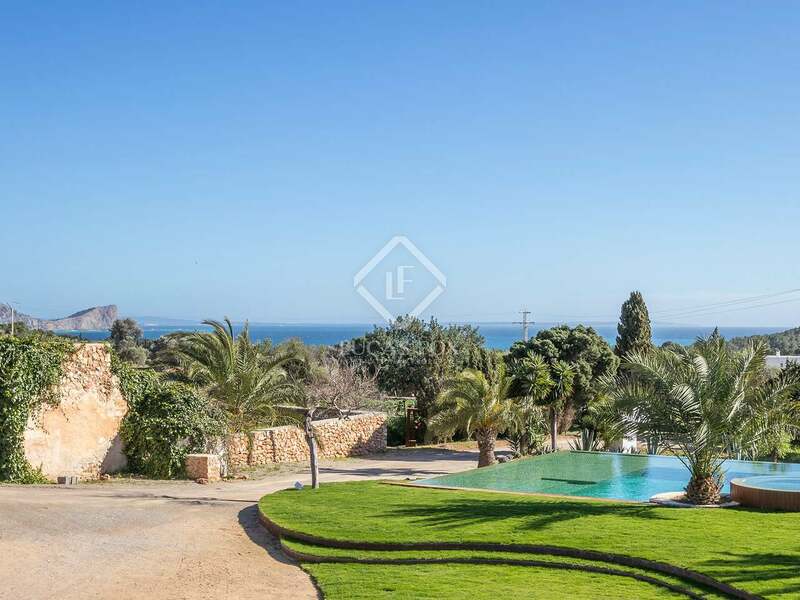 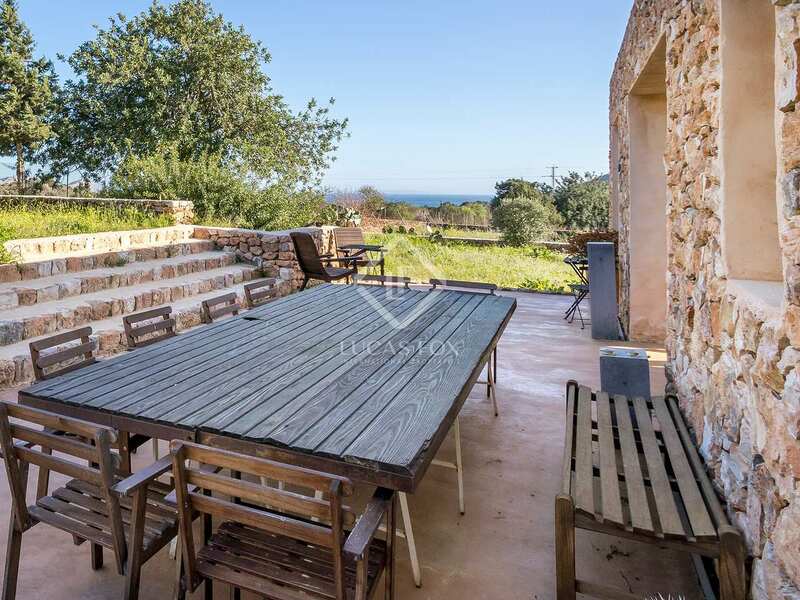 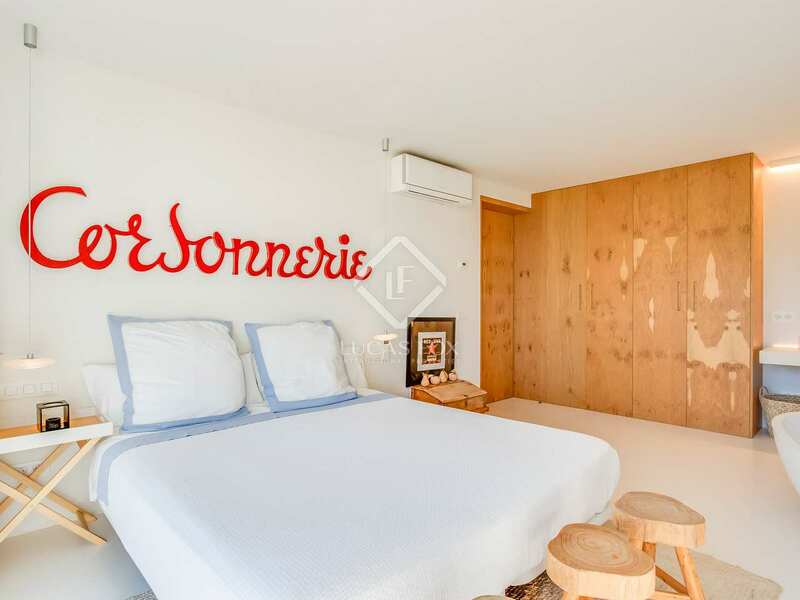 The villa has wonderful sea views from many of the rooms, as far as the island of Formentera. 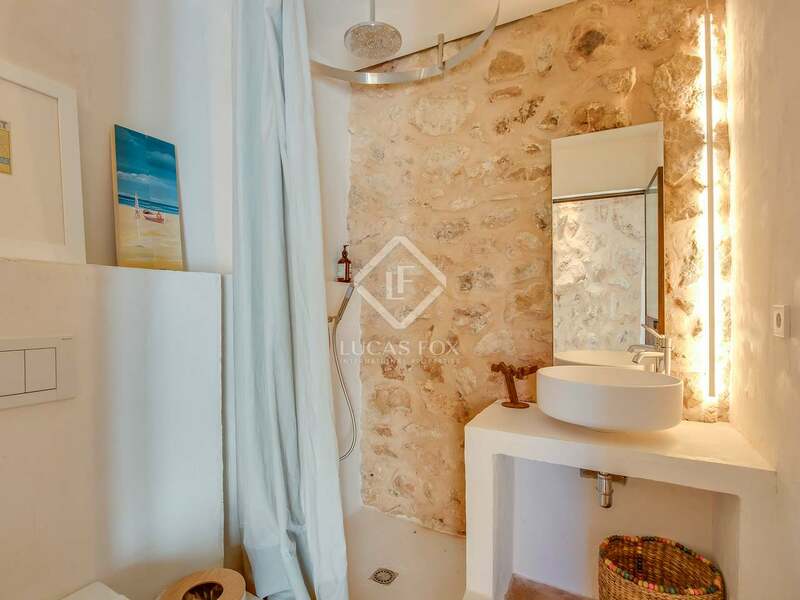 A seperate guest house is included in the price and is perfect private accomodation for visitors. 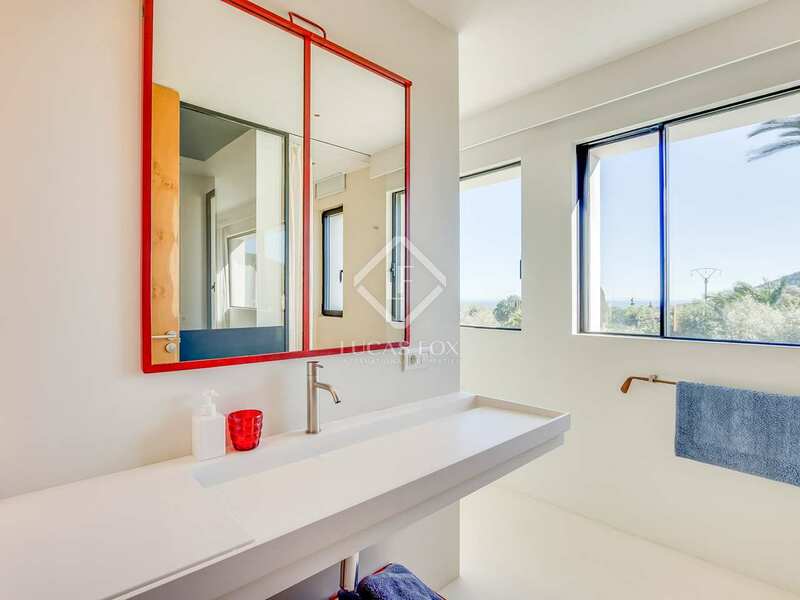 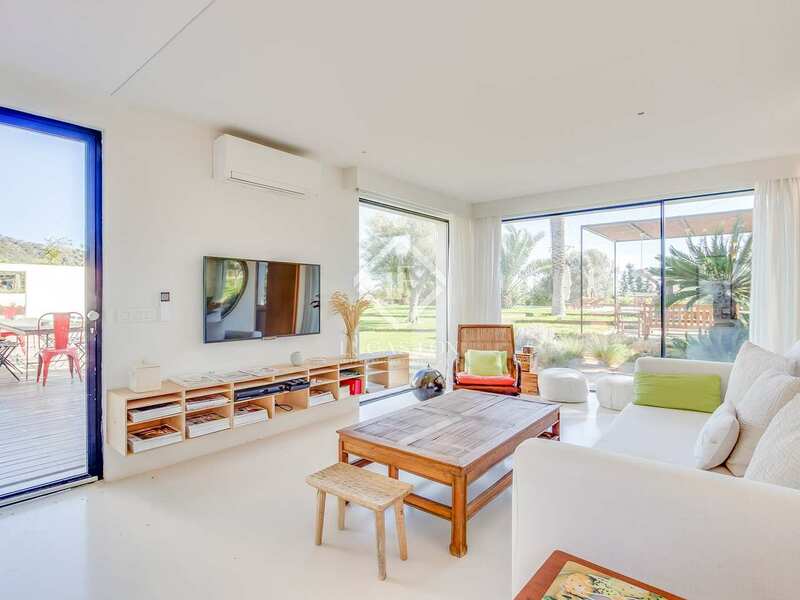 Further notable features include air-conditioning, satellite television, ipod/iphone stations and an alarm system for total comfort and peace of mind. 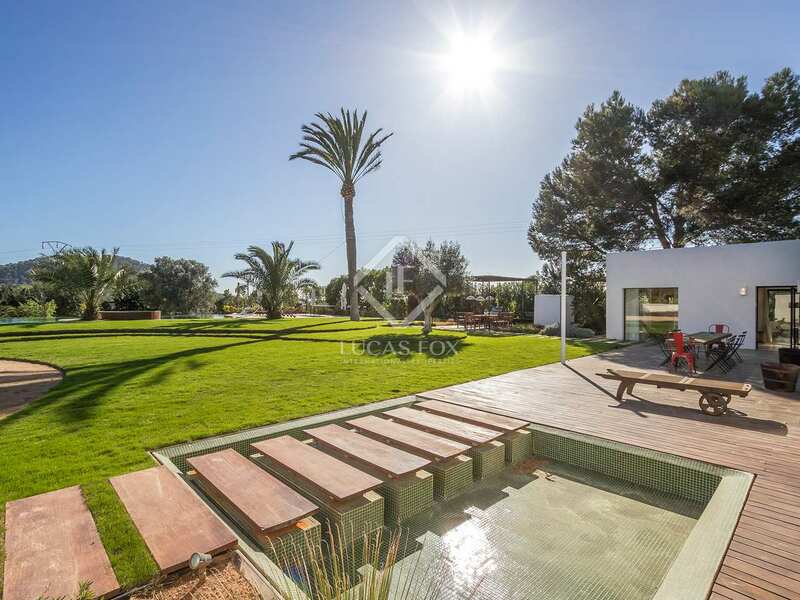 The outdoor spaces are equally impressive. The lush green gardens and infinity pool are perfect for enjoying the long summer months, covered and uncovered terraces provide space for al-fresco dining. 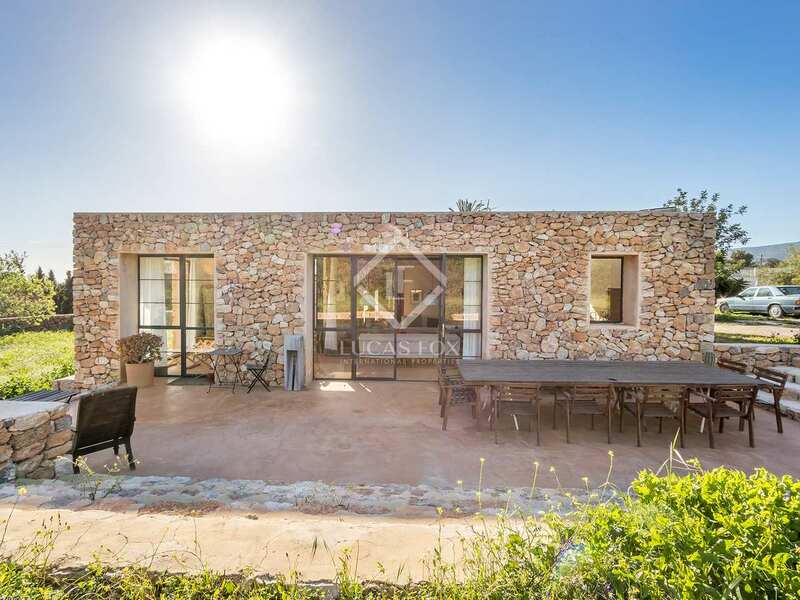 The property has solar panels for energy efficiency. 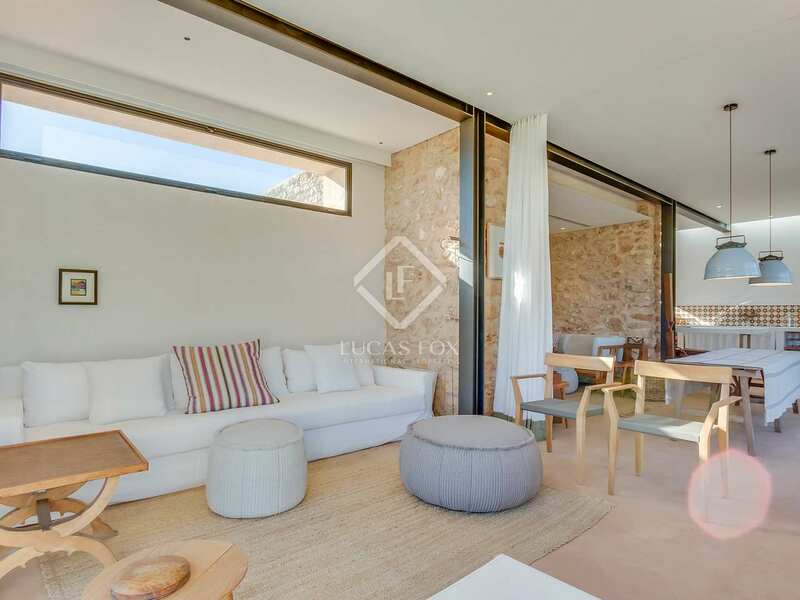 An excellent option for those seeking a modern with plenty of privacy yet well located to enjoy everything the island has to offer. 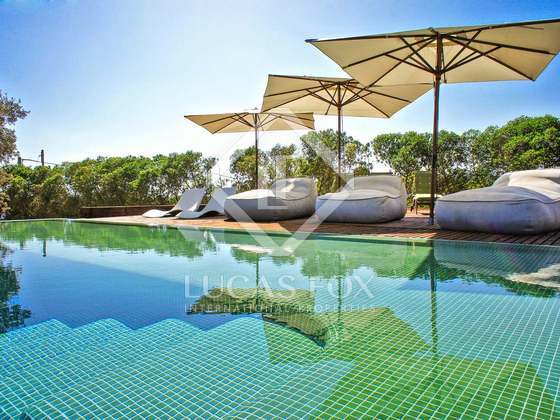 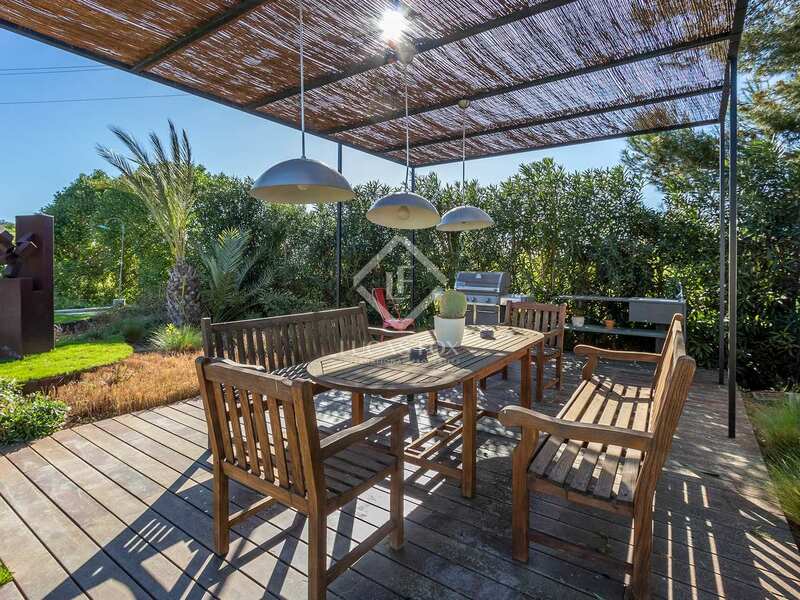 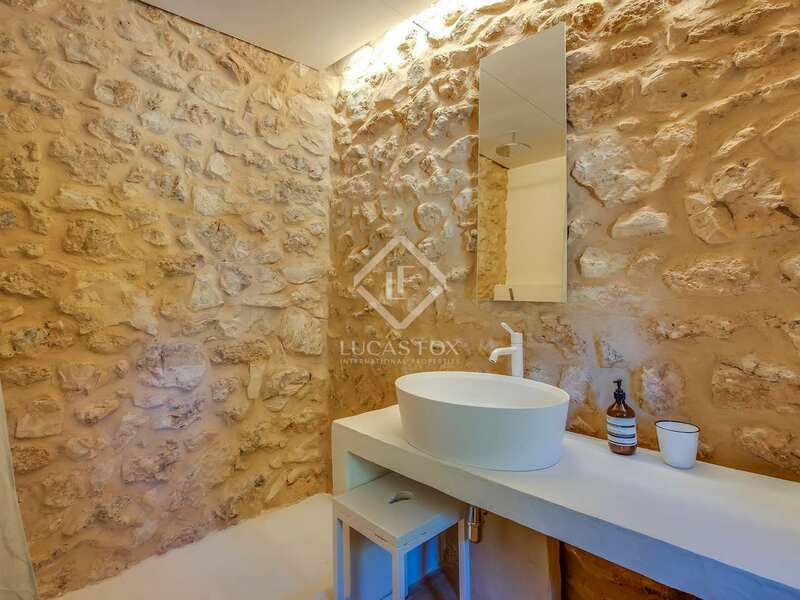 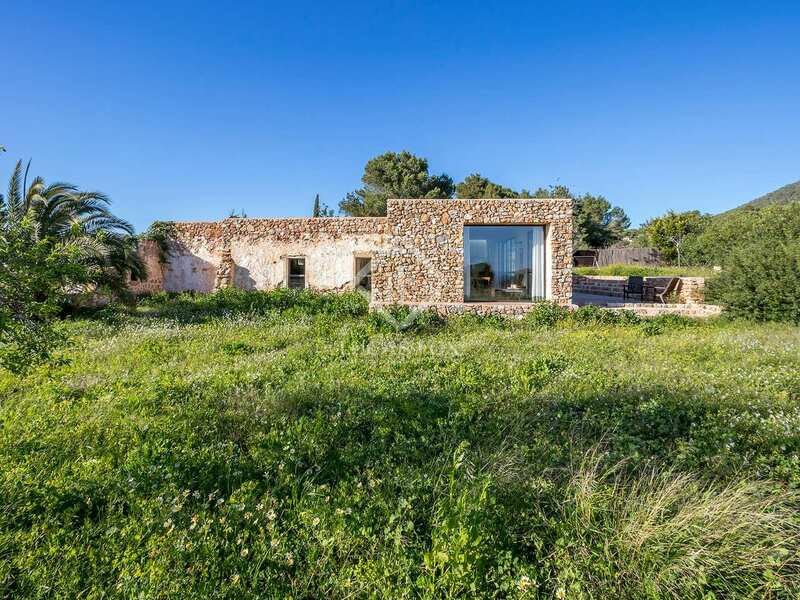 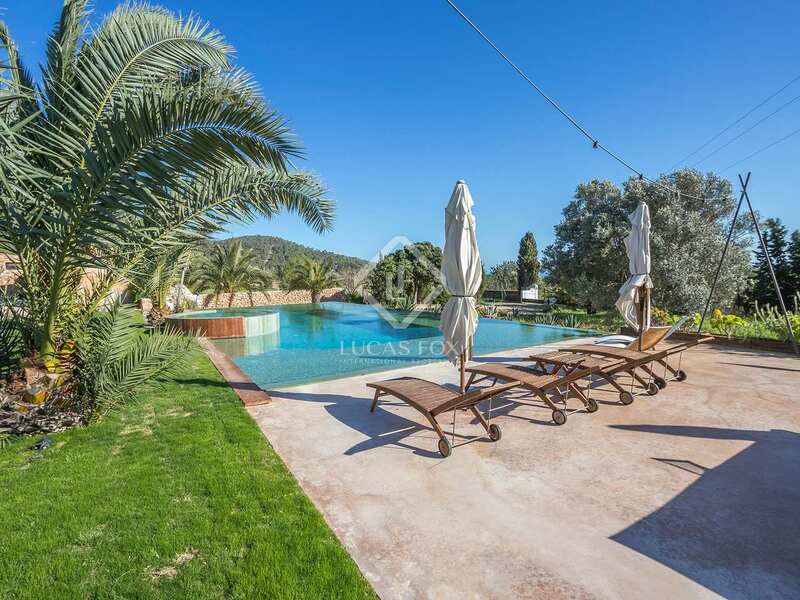 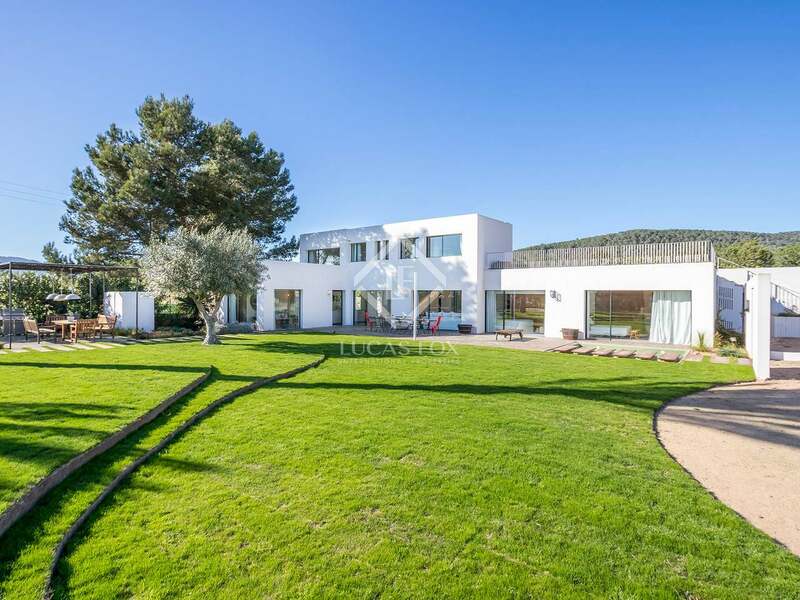 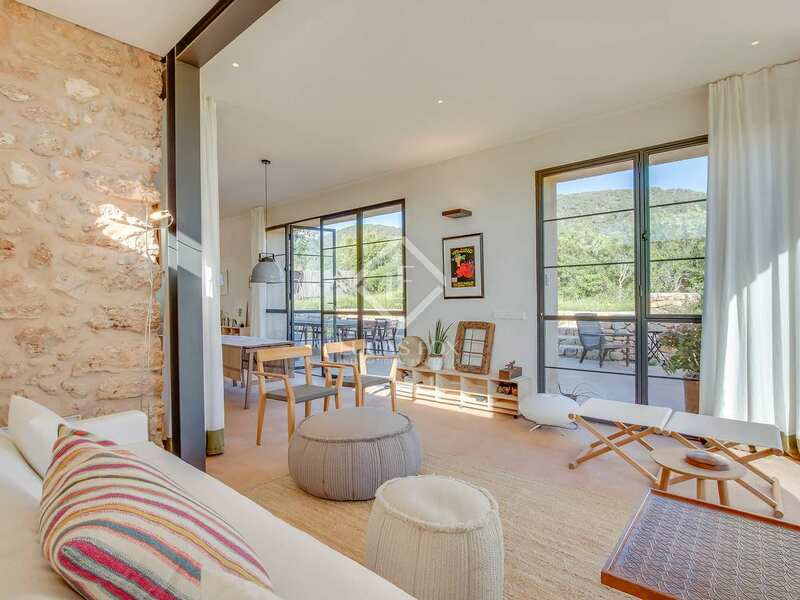 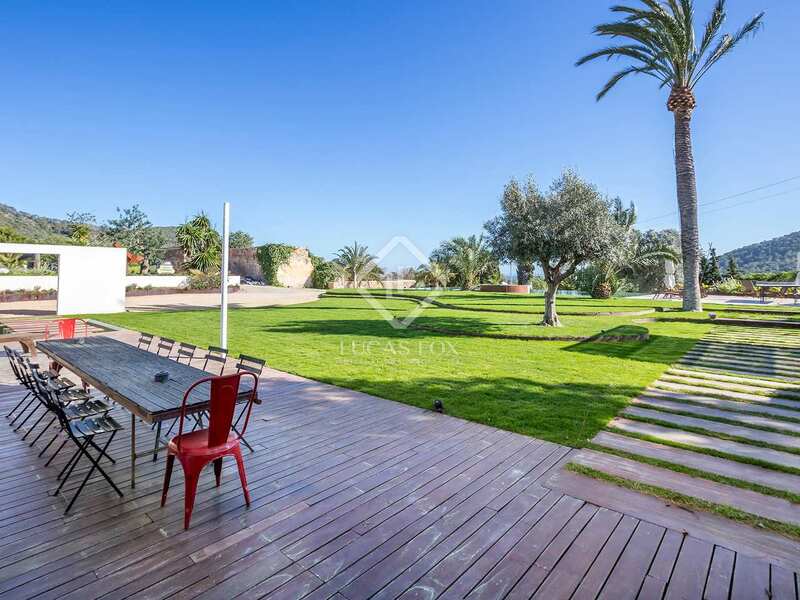 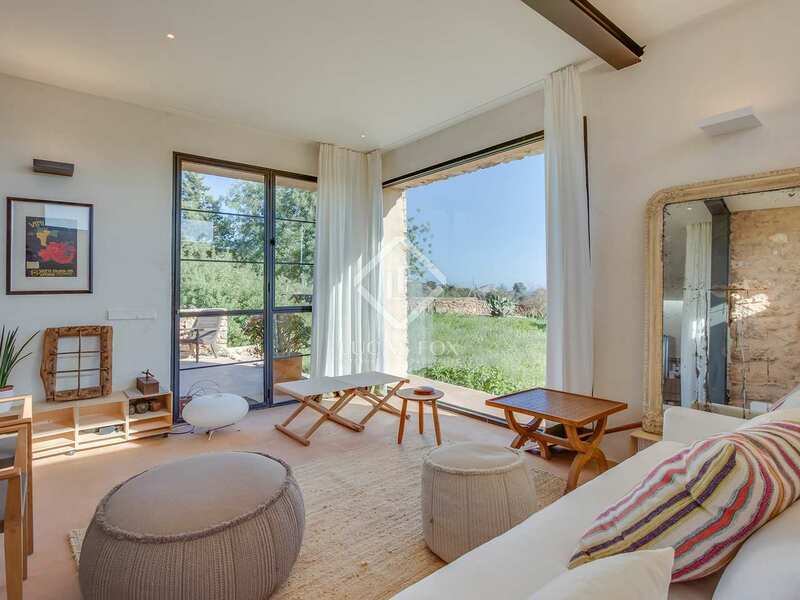 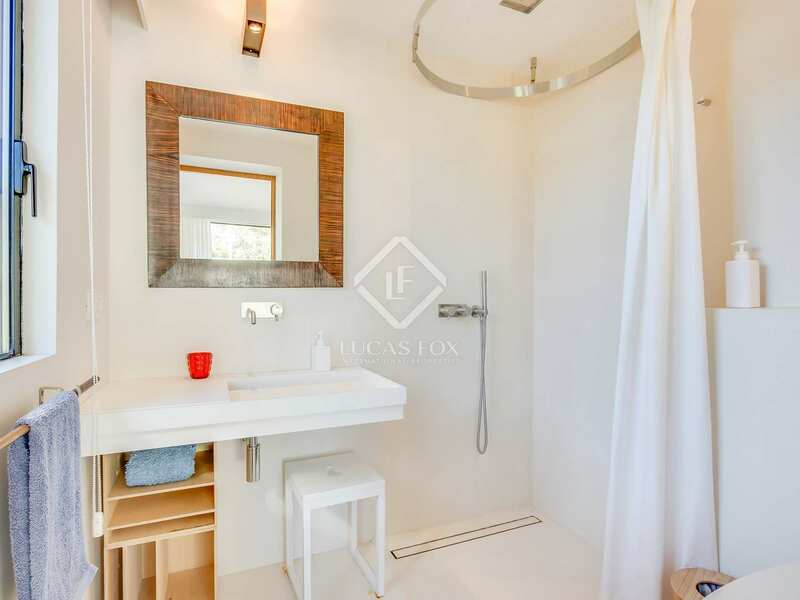 This villa enjoys a strategic location 15 minutes to Ibiza town and 10 minutes San Jose. 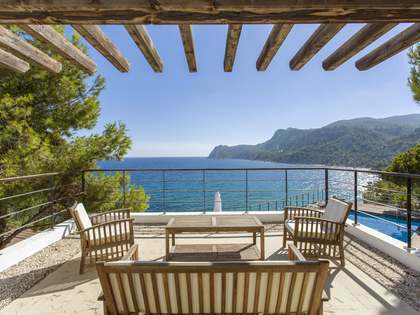 Beautiful beached including Cala Jondal Beach and Blue Marlin beach are just 5 minutes away by car. 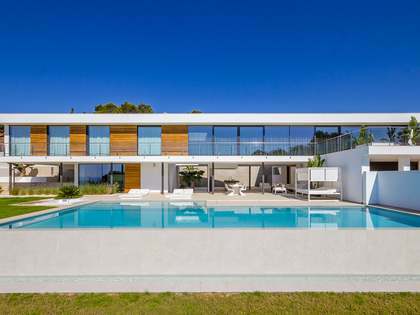 Ibiza airport is reached by car in 7 minutes whilst Marina Botafoch is 17km from the property.